for any exchange of information. CentraXX MDR – It’s like real life: When two people say the same it doesn’t have to be the same. And sometimes they mean the same thing, but say it differently. If other communication participants and channels are added, the entire communication process becomes more and more complicated and misunderstood until it may eventually collapse. It is similar when two or more IT systems that use different words for the same thing or apply different units of measure for the same measured result are interfaced. In a closed CentraXX system, the Meta Data Dictonary structures all data elements sensibly. Bringing together as many data points as possible from different systems into a central system, which in turn can be accessed by all participating users, delivers better results due to the amount of information obtained and linked and the resulting greater comparability. For the purposes of effective personalized medicine, it is necessary to collect as much of a patient’s data as possible from a wide variety of systems and to map it out in an overall context. This data must comparable with the patient’s data from other systems – of course whilst adhering to applicable data protections regulations. 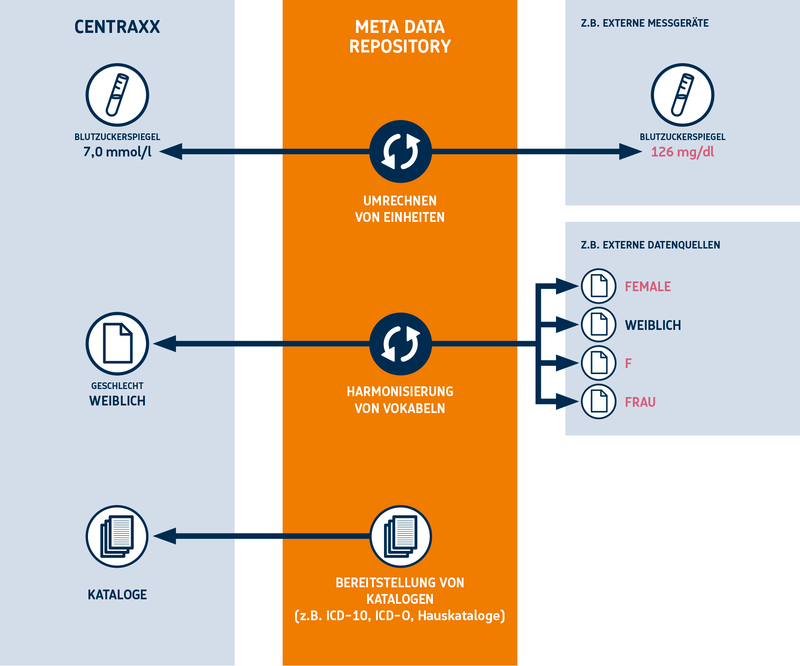 The use of the CentraXX MDR promotes the interoperability of all platforms connected in an IT infrastructure (e.g. subplatform for treatment and subplatform for research). This is achieved through establishing a common vocabulary (Meta Data Dictionary) and a common interpretation (Meta Data Definitions). This results in an increase in the effectiveness of the entire system, including the planning and creation of new databases and documentation processes. 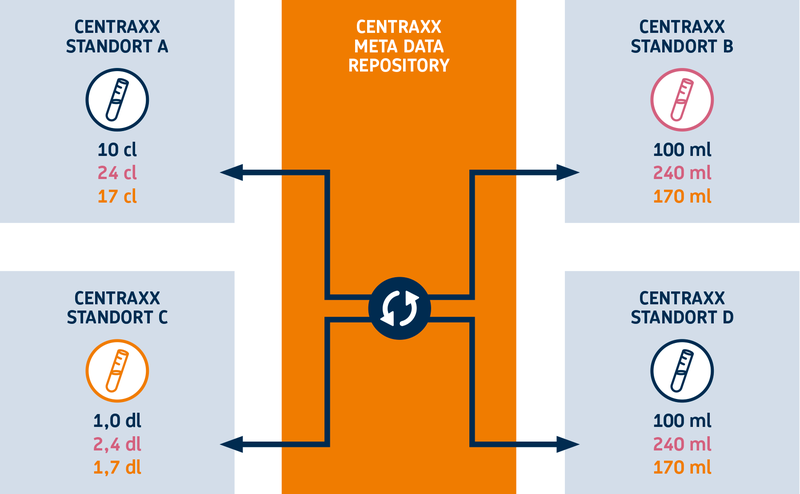 The CentraXX Meta Data Repository maps the master data of all system subplatforms using a MetaDAT converter for the harmonization and brokerage of existing metadata. Catalogues of any kind can be stored and made available to all connected systems. These can be standard catalogs (e.g. ICD-10, ICD-O, OPS,…) or customized catalogs and third-party catalogs. Data points are defined with a unique identifier and a meaning and description for an »item« in the MDR. All items defined in this way form the item pool. All items are reusable and do not have to be redefined for each use. 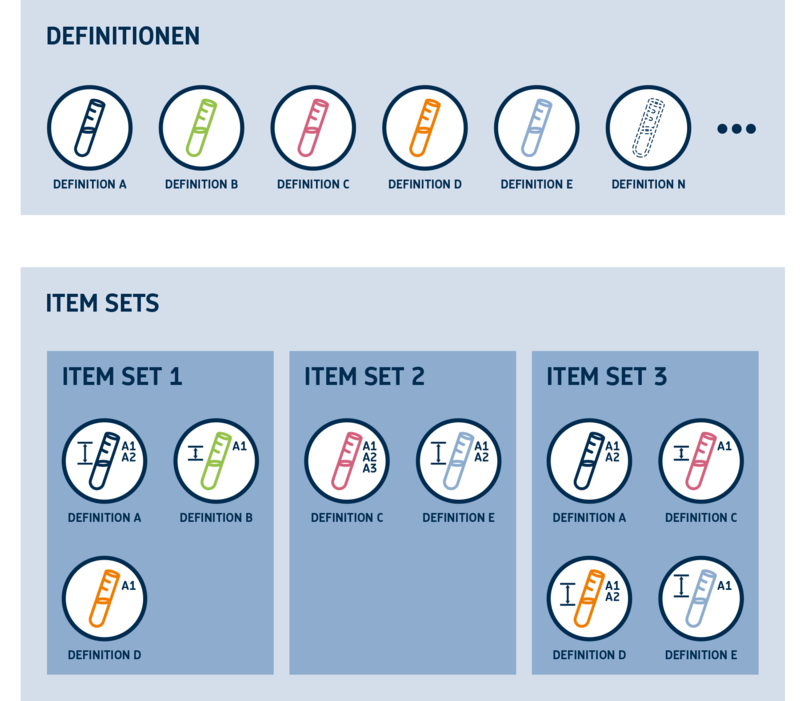 Together with independent attributes and reference ranges, these can be transferred to an individual item set in the desired structure. 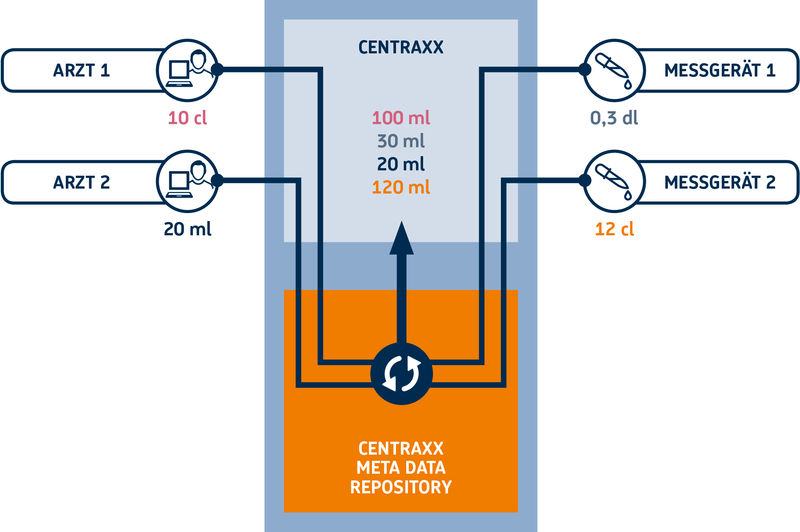 Detailed information about the CentraXX MDR can be found on the MDR product sheet.